Sabrina Quaraishi is Client Relations Manager for Grameen Foundation’s Bankers Without Borders® program. We are very excited to launch the Bankers without Borders Alliance Program as a way to utilize the increasing number of skilled volunteers who join our program to donate their time and skills in the space of microfinance and technology for the poor and at the same time serve the various needs of microfinance institutions and other organizations serving the world’s poor. Harvard & Haas Business School students working on a BwB volunteer project. To expand volunteerism in the microfinance and technology-for development sectors, Bankers without Borders, an initiative of Grameen Foundation announced the availability of US$150,000 in seed capital to microfinance associations and other pro-poor organizations interested in expanding Bankers without Borders volunteer services to Asia and the Americas. Presented by J.P. Morgan, the Bankers without Borders Alliance Program aims to establish a global network of local organizations who can help identify and scope volunteer projects that can benefit from the pro bono services of the more than 4,500 skilled business professionals from around the world willing to donate their time and expertise to help microfinance and technology organizations improve their scale, sustainability, and impact. This first round of competition will focus in Asia and the Americas. Future rounds of funding will focus on expanding the program in Africa and the Middle East. A formal request for proposals both in English and Spanish can be found at http://www.bankerswithoutborders.com/mfis-networks. The deadline for submission is September 30, 2010. Selected organizations will be announced in November 2010. Stay tuned for our next Asia technical call. Please check back with us at http://www.bankerswithoutborders.com/mfis-networks for details on our next call. Fred Graves is an intern at Grameen Foundation, working with our Mifos® Team in Seattle, WA. Fred’s passions include microfinance as well as music. To help Grameen Foundation win a $200,000 grant, Fred wrote, performed & filmed what we believe is the best rap video about microfinance. This post is also featured on the Huffington Post Impact website. When I was approached by our marketing department to put together a song for the Members Project, I was stoked. Hip hop has been a passion of mine for years, and Microfinance is rapidly becoming my foremost interest. I was excited about the chance to combine the two in one project. Upon receiving the assignment, I began my usual artistic routine of composing the lyrics in my decrepit rhyme book on my bus ride to and from work. The biggest challenge was that I had no instrumental with which to write the song. Enter Michael Ehrhart (AKA Agent M), a friend of mine since high school who composes beats in his free time. I contacted him and no more than two days following our conversation I had myself a “banger” track to write to. Even more impressive was that he composed the beat around a sample he took from a song performed by a Ghanaian singing group recorded by field workers on Grameen Foundation’s MoTech project. We recorded the song in a studio at Western Washington University where Mike is fulfilling his undergraduate degree. We knocked out the recording with relative ease and even managed to record the vocals for some other projects we are working on as well. With the song composed, the next step was to film the music video. Enter Scott Everett, a coworker of mine at the Grameen Technology Center. It may come as a surprise to the viewers of the video, but this was actually Scott’s first ever endeavor at filming. Despite his years of experience with photography, he had yet to branch out into the world of motion picture. However, not only was Scott able to adapt quickly to the unfamiliar task, his creativity behind the lens added a whole new dimension to the video. Next we lay the vocals over the beat and edited the footage. We integrated profiles of several Grameen Foundation borrowers to really bring home the message of who we are truly working for. Mike was great to collaborate with, and as a result the video turned out even better than I had anticipated. So with the draft of the video complete we put it up on YouTube for a trial release within Grameen Foundation. I credit the feedback I received from my coworkers for truly taking the video to the next level. They offered a plethora of candid feedback that I took to heart, and as a result we cleared both the song and video of several blemishes that would have certainly detracted from the video’s impact. I would like to thank Mike, Scott and my friends at Grameen Technology Center for providing me with the assistance critical to making this project a success. So check out one of the select few microfinance music videos in circulation and enjoy! Grameen Foundation supporter and actress Yeardley Smith (voice of “Lisa Simpson” on the popular TV show The Simpsons) and President and CEO Alex Counts traveled to Bangladesh in late July 2010. They visited Grameen Bank and some of the other enterprises Professor Yunus has launched to accelerate poverty reduction. This is Alex’s fifth and final blog post chronicling their visit. 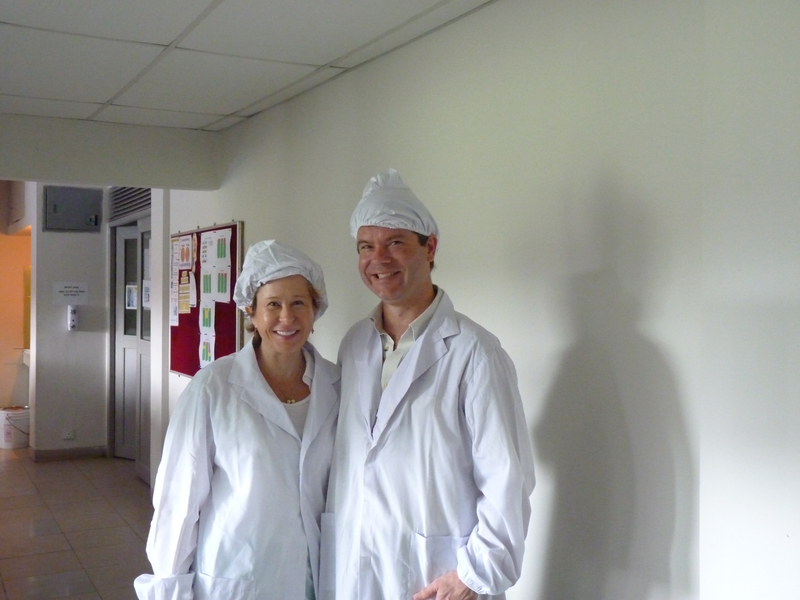 My trip to Bangladesh with Yeardley Smith and the rest of our delegation was a terrific learning experience. It proved to be a window into a possible future for microfinance, since Grameen Bank, its affiliated companies, and other groups in Bangladesh are far ahead of the rest of the movement in many ways. On the morning of our sixth day, we were joined by three French interns with Grameen-Danone. The original social business focused on combating malnutrition and poverty, Grameen-Danone produces fortified yogurt and engages the poor in the production and sales processes. First stop was one of four collection points where Grameen-Danone contractors test and purchase milk from local farmers, including quite a few Grameen borrowers. They set up in a convenient location and guarantee a fixed price all year round—both of which, based on random interviews I conducted, are appreciated by the local people even if they can occasionally get a higher price in local markets miles away. Grameen Foundation supporter and actress Yeardley Smith (voice of “Lisa Simpson” on the popular TV show The Simpsons) and President and CEO Alex Counts traveled to Bangladesh in late July 2010. They visited Grameen Bank and some of the other enterprises Professor Yunus has launched to accelerate poverty reduction. This is Alex’s fourth blog post chronicling their visit. Yeardley and I began our fifth day in Bangladesh with a two-hour meeting with Professor Yunus. He was as warm, gracious and engaging as always. We discussed his debut as a character on an upcoming episode of The Simpsons and Yeardley’s reactions to her field trips (her main take-away: “Bangladeshis seem very busy!”). Dr. Yunus showed us short videos about two new social businesses being launched, the Nursing College and the network of Eye Hospitals (two hospitals and counting). We needed to shield our eyes during what felt to us like graphic footage of a cataract surgery! Later, he explained how in most countries (and for good reasons) there are three nurses for every doctor, but in Bangladesh, it was the reverse. As a result, health care suffered. The Nursing College, launched in March 2010, will grow from graduating 100 nurses per year to 1,000. He also gave us a preview of one of the eye hospitals and Grameen-Danone located in the northern district of Bogra. After our meeting, Professor Yunus spoke to a group of visitors from Pakistan, South Korea and Africa who were beginning a two-week study tour of Grameen, while we spent some time with Nazneen Sultana, head of Grameen Communications. This division handles all the IT for Grameen Bank and several other companies. Next, Yeardley did an interview with the Daily Star, the country’s top English language daily. Finally, we joined Professor Yunus and the group of international visitors for a quick lunch. The visitors all wanted their pictures taken with Dr. Yunus and Yeardley! GF supporter and actress Yeardley Smith (voice of “Lisa Simpson” on the popular TV show The Simpsons) and President and CEO Alex Counts traveled to Bangladesh in late July 2010. They visited Grameen Bank and some of the other enterprises Professor Yunus has launched to accelerate poverty reduction. This is Alex’s third blog post chronicling their visit. Our third day in Bangladesh was a day of rest. On day four, the five of us headed to Gazipur, north of Dhaka. Although Saturday is a bank holiday, it’s a working day for Grameen Shikkha, the arm of the Grameen family of companies that promotes education. We spent about an hour at a preschool program that Grameen Shikkha runs with PLAN International and the local primary school. They recruit and train local teachers to provide learning and enrichment for students ages 3-5 in the nearby villages, which prepare them for success in first grade—similar to Head Start in the U.S. 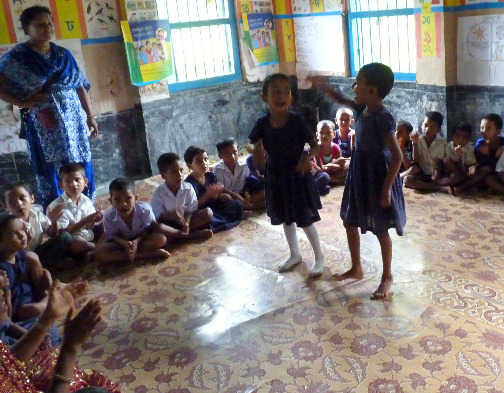 Despite the limited facilities, the children—about 30 of them—were eager to learn. The teacher was energetic and focused on drawing all the kids in to learn and play. The Grameen Shikkha staff were mostly retired Grameen Bank employees (most appeared in their 40s) enjoying a second career. We also interviewed eight of the 503 Grameen Foundation-supported recipients of Grameen Shikkha scholarships. Each student knew that Grameen Foundation was the donor providing their scholarships, and that Microsoft Corporation (in three cases) and a Seattle nonprofit (in the remaining five) had staked us to create a perpetual endowment that was benefiting these students during their high school years. They used their monthly stipends of $4-$8 (depending on the size of the endowment) to pay education-related expenses. They’d practiced their English, and with a few promptings in Bengali, they were each able to complete three-minute interviews with us. It was sobering to hear that each student’s parents, if alive, had received little if any formal schooling. 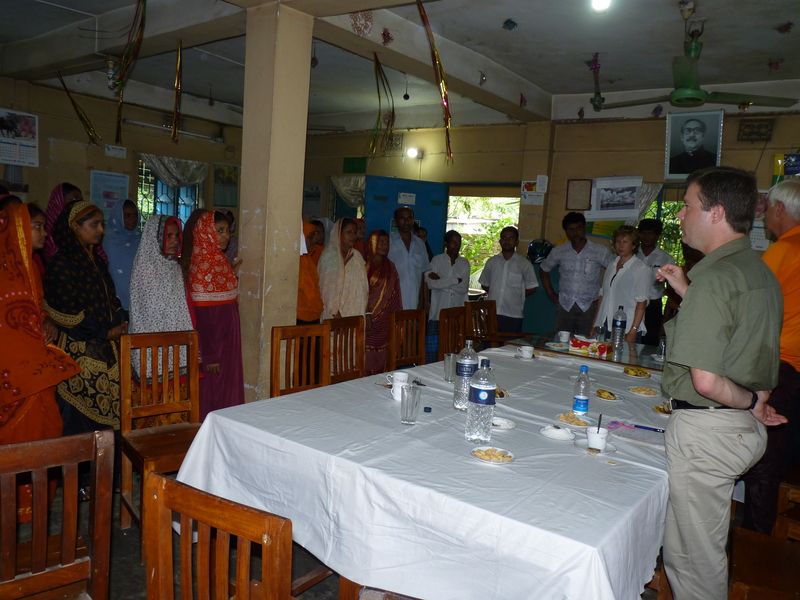 We then visited Grameen Bank clients’ homes in rural Bangladesh. One woman, Phul Khatoon, was very pleased with how well stocked her small general store was (thanks in part to successive Grameen loans). Later, we sped back to Dhaka to get ready for dinner with Professor Yunus, his wife Afrozi, and some of his senior staff. Around a rectangular table in a semi-private room of an Indian restaurant, Andy enjoyed discussing social business with Professor Yunus, while Yeardley spent the evening getting to know Afrozi, a physics professor. By the time we reached out hotel, we were ready for a good night’s sleep! GF supporter and actress Yeardley Smith (voice of “Lisa Simpson” on the popular TV show The Simpsons) and President and CEO Alex Counts traveled to Bangladesh in late July 2010. They visited Grameen Bank and some of the other enterprises Professor Yunus has launched to accelerate poverty reduction. This is Alex’s second blog post chronicling their visit. At 8 am, we departed our Dhaka hotel in a van with a driver and a guide from Jannat’s international training team, heading to the Gorai Mirzapur branch, about fifty miles northeast of the capital. This, however, turned out to be something of a mistake as we hit rush hour traffic again. Somehow we managed to arrive for a borrowers (or center) meeting at 10:05 am, only five minutes late. We were joined by Andy Pleatman, a Hong Kong-based financial supporter of Grameen Foundation, and his daughter Kim. Over the next forty minutes, we had a spirited discussion with 60 Grameen members that pushed my translation skills to the limits and beyond. One woman shared how she had taken a Tk. 1,000 (about $15) loan 22 years ago and now was able to borrow and productively invest 30 times that amount in raising livestock and shopkeeping. Another proudly spoke about the three cows she now owned free and clear after taking a loan to buy them. Several mentioned that they’d built houses nearby to rent out to laborers who migrated to the area for work in new factories nearby. 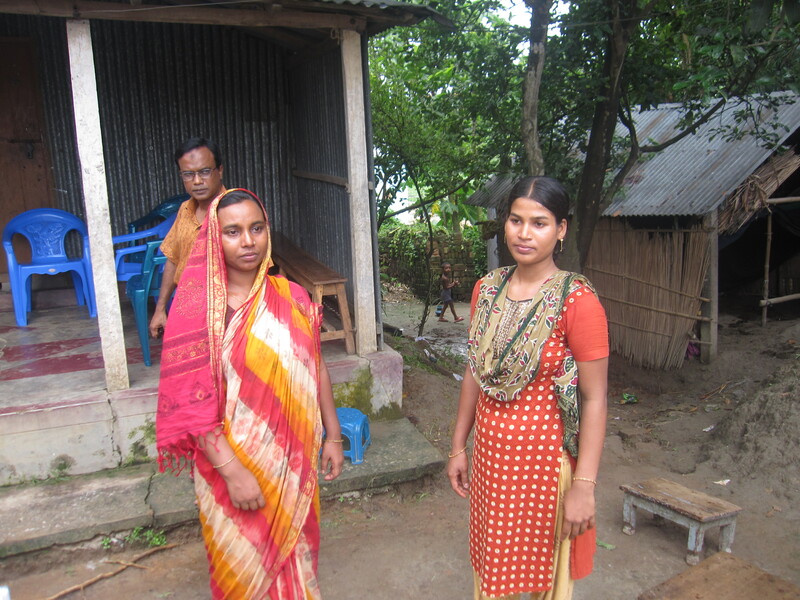 When we asked the newest borrowers (i.e., less than three years in Grameen) to stand up, their lack of self-confidence in addressing us starkly contrasted with those who had been borrowing longer. Also striking was how few children all of the women had—all the ones we asked had one or two. GF supporter and actress Yeardley Smith (voice of “Lisa Simpson” on the popular TV show The Simpsons) and President and CEO Alex Counts traveled to Bangladesh in late July 2010. They visited Grameen Bank and some of the other enterprises Professor Yunus has launched to accelerate poverty reduction. This is Alex’s first blog post chronicling their visit. Yeardley’s and my flight arrived at Dhaka’s International airport one hour late, after which we had the pleasure of navigating Dhaka’s ever-worsening traffic to get to our hotel. During lunch, I prepared her for the days to come, explaining that this trip would be different from the time we spent in May 2009 witnessing microfinance in Haiti. We then started for the Grameen Complex in Mirpur—traffic stretched a usually short trip to 45 minutes. To get a sense of Grameen’s 30-year history, we met with three individuals who were with Professor Yunus during the organization’s nascent years in the mid-1970s. Jannat explained to Yeardley what it was like during the early years with Professor Yunus—before the worldwide acclaim for his achievements in reducing poverty, which spawned a global financial services industry for poor women. She also explained the itinerary for our six days in Bangladesh—her team had worked out every detail.